Is Yahoo! Mail Down . . . or Is It Just You? It can be frustrating when you can’t connect to Yahoo Mail. Ideally, there would be a simple way to tell when Yahoo Mail services are down or struggling. But unfortunately, as of early 2019, Yahoo! Mail does not provide system status information for their free mail services. Unlike many other web service providers, that means that you can’t quickly identify the status of Yahoo!’s services. The following sequence of steps may help you identify and/or resolve problems you have accessing Yahoo! Mail. Additionally, a quick search of Twitter can help you figure out if other people are experiencing problems connecting to Yahoo! Mail. Search for terms such as Yahoo! Mail, YahooMail, or #yahoomail. Follow the links on each of these terms to see recent Twitter search results for each item. If you see several recent Tweets from people that mention problems with Yahoo! Mail, any issue you are experiencing likely affects many accounts, not just yours. Check third-party status services to see if other sites can't access Yahoo Mail. Open your browser to the service https://isup.me, for example, and enter mail.yahoo.com to see if the site can connect to Yahoo Mail. Alternatively, DownDetector maintains a status page that tracks and reports connection and outage problems for Yahoo Mail at https://downdetector.com/status/yahoo-mail. At any given time, you should expect to see at least a few problems reported. However, if you see hundreds or thousands of issues identified, the problem is almost certainly an issue outside of your control. If either of these status services indicates an issue, you can stop troubleshooting. The problem is one that the team at Yahoo Mail will need to work to resolve. If no problems are reported with these tools, it’s time to troubleshoot your setup. Open a web browser on your device to see if you can connect to other websites, such as google.com. If you can’t connect to the internet, you may have a network connection problem. If you use a laptop, tablet, or phone, you might try to connect to a different network. For example, try to connect to a different Wi-Fi network nearby, such as at a local library, coffee shop, or workplace. Or, if your device has a cellular connection, such as a smartphone, turn off Wi-Fi so that your device connects instead to your mobile provider’s network. After you switch networks, try to connect to Yahoo! Mail again. 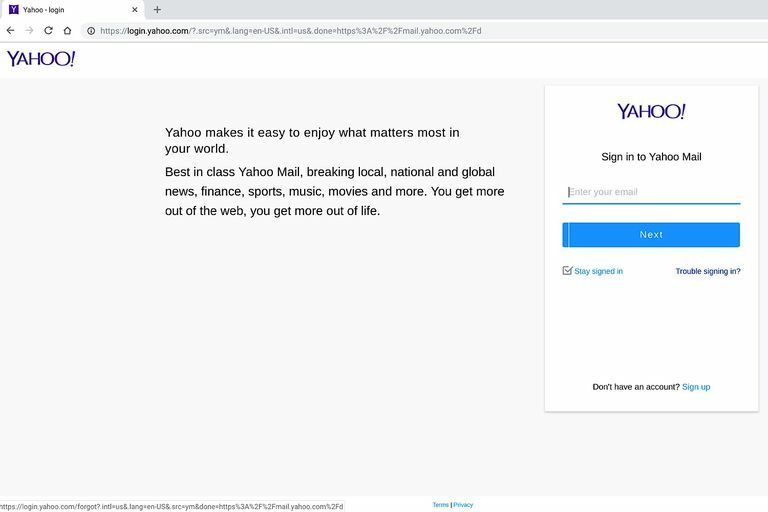 Try a different way to connect to Yahoo Mail. If you typically use an app to access Yahoo! Mail, try a browser. Or, if you typically sign in to Yahoo! Mail with one browser, try a different browser. You might install and try Chrome, Firefox, or Brave to access Yahoo! Mail. All three of these browsers offer versions that work on Windows, macOS, Android, and iOS devices. Or, if you usually use one of these three browsers, switch to Safari (on macOS and iOS systems) or Edge (on Windows, iOS, or Android systems). Choose one of the above browsers, install it on your device, open it, then go to https://mail.yahoo.com and sign in. If you use an Android, iPhone, or iPad, you might install the Yahoo Mail app to directly connect to Yahoo Mail. Unlike mobile mail apps that may require some adjustment of settings or configuration customizations, the mobile app from Yahoo is expressly intended to deliver access to Yahoo Mail on your mobile device. Install either Yahoo Mail for Android or Yahoo Mail for iOS, then sign in to your account. If you have access to another internet-connected device, try to access your Yahoo! Mail on that device. For example, if you’re having difficulty accessing Yahoo Mail on a desktop computer, switch to a laptop, tablet, or smartphone, instead. Open a browser on this different device, and go to https://mail.yahoo.com and sign in to your account. When the system won’t accept your account name and/or password, start the password recovery process. Follow the instructions, which will vary based on the recovery method and information you’ve provided. If none of the above methods gives you access to your Yahoo Mail account, you may need to contact Yahoo support for help. See How to Contact Yahoo for Support Information to contact the company. Hopefully, one of the steps above helped you identify the problem. And, once the issue was resolved, you should be able to access email once again. Yahoo!